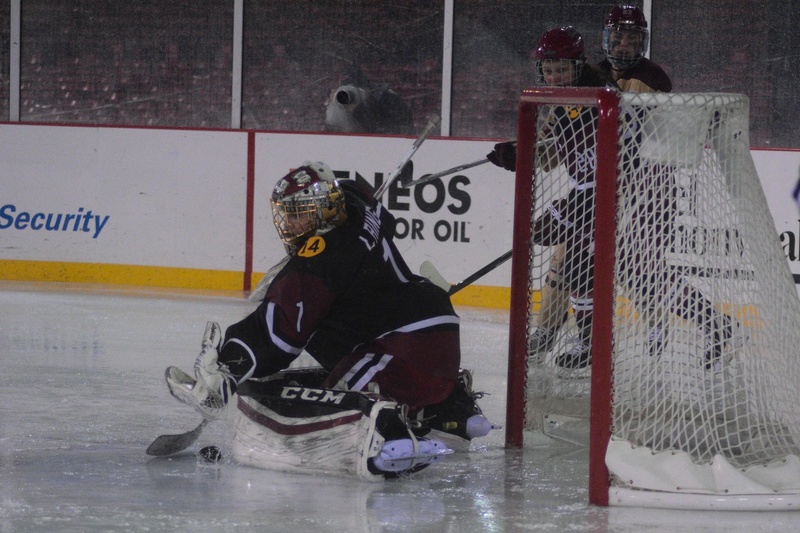 In photos: Harvard Women's Hockey takes on Boston College under the lights of Fenway Park. 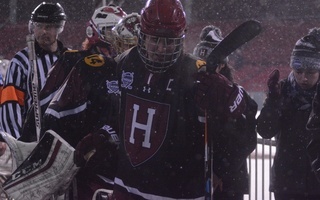 Three years after the Crimson women's first opportunity to take the ice at Fenway was spoiled by inclement weather, Harvard finally got its chance to play at America's Most Beloved Ballpark on Tuesday night. Senior goaltender Brianna Laing leads the Crimson out of the visitor's dugout on a path towards the rink stretched across the baseball diamond. Harvard held BC's third-ranked scoring offense at bay in the first period. 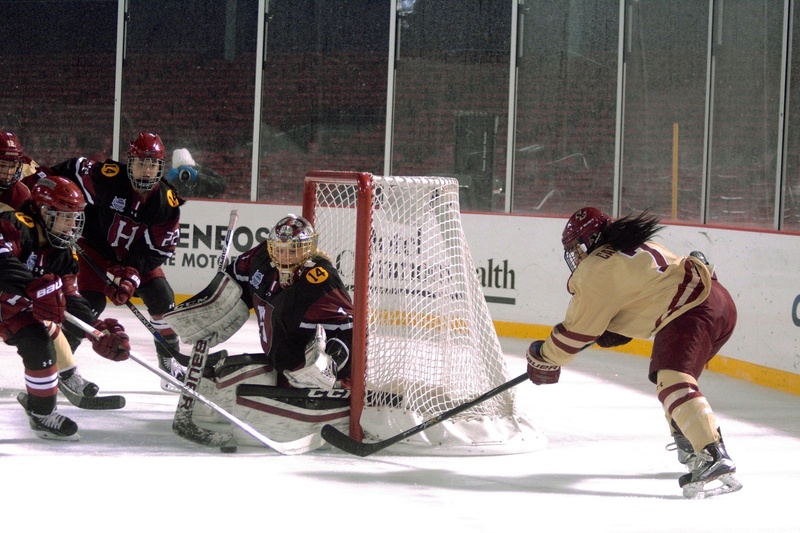 Laing and junior defenseman Chelsea Ziadie (24) cut out this chance for BC forward Kristyn Capizzano midway through the frame. 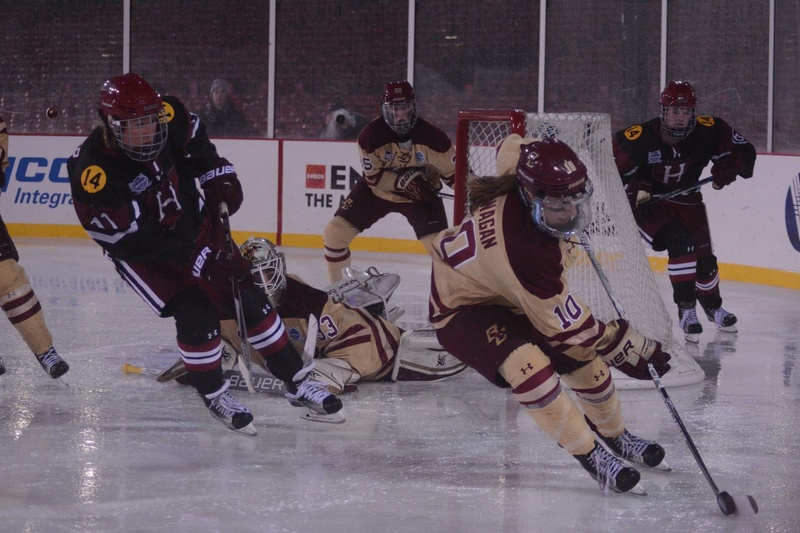 Sophomore forward Kate Hallett wasn't the only one wearing Number 14 for Harvard on Tuesday. 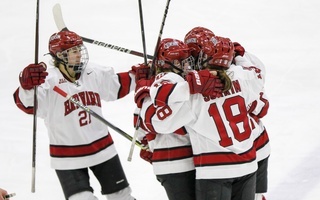 Every Crimson skater sported a "14" patch on each shoulder to honor the iconic Denna Laing—the older sister of Harvard's Brianna and Lexie—who dropped the ceremonial puck before the game. 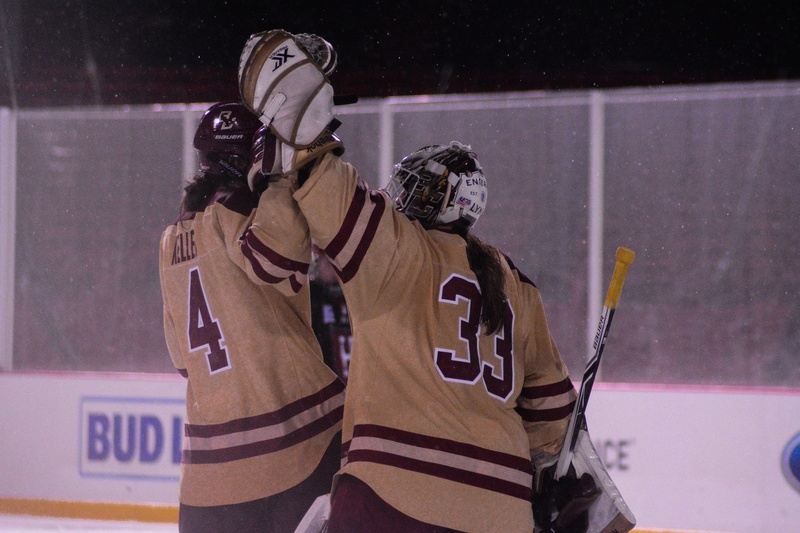 Period two belonged to the Eagles, who scored twice in the frame, prompting celebrations like this one between junior goaltender Katie Burt and classmate defenseman Megan Keller. Rain splashed against the ice all night long, and conditions grew worse with time. Co-captain Sydney Daniels and the Crimson set course for their much drier locker room at the second intermission trailing 2-0. 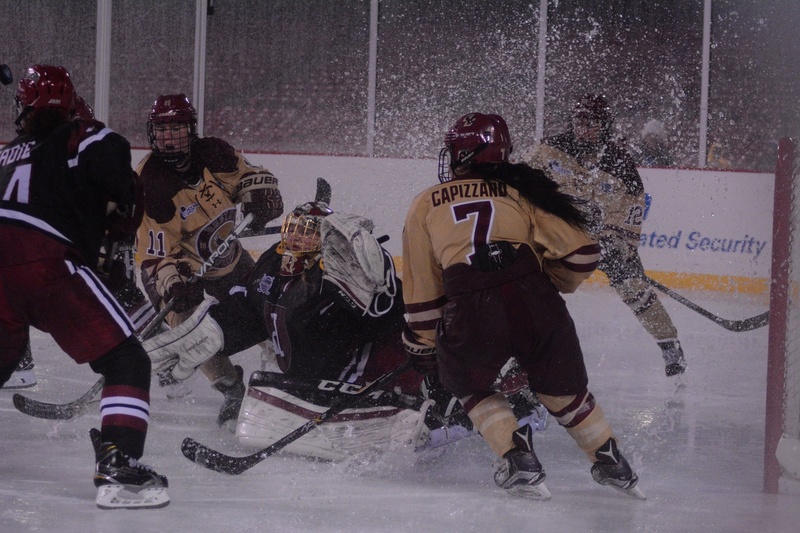 Laing makes one of her 27 saves—this one on a shot that skidded through the rain-soaked crease in the third period. Late in the game, Laing spent several stoppages of play squeegeeing the area around the goalmouth with her stick. But in spite of Laing's efforts, the crease never remained dry for long. 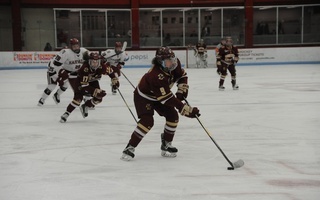 The Eagles scored one last time with 7:06 remaining in the game when redshirt freshman Erin Connolly, a South Boston native, notched her second goal of the night to put BC up 3-0. Harvard would not leave the ballpark empty-handed, however. The Eagles skated away victorious, but freshman forward Kat Hughes (19) put the Crimson on the board with 5:02 left to play, earning the night's final trip around the bases.